Tutor Mentor Institute, LLC: What Can You Do to Help? I wrote a couple of "do over" articles a year ago after the Oscars. And since 2011 I've met with a lot of people. I need to figure out a better answer to this question than what I've given in the past because too few conversations where someone asks "What Can I do to Help?" result in them actually doing work that helps me further the goals of the Tutor/Mentor Connection (and Tutor/Mentor Institute, LLC) which I started in 1993. First. I'm trying to find people from different industries, universities, faith groups, etc. who will build their own understanding of the strategy map shown below, and put a version of it on their own web site, with their name/photo/web site, etc in the Blue Box at the top of the map. People who make this commitment can be from any place in the world. 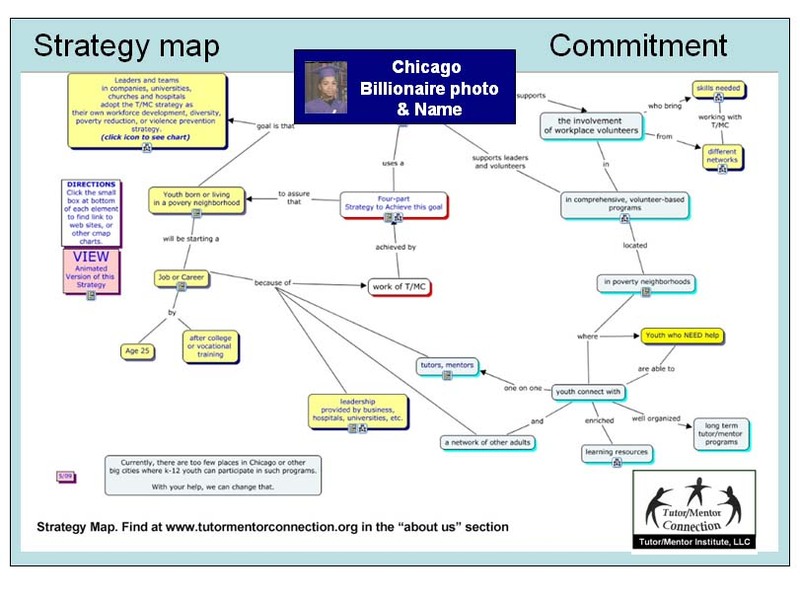 In the middle of the graphic, right below the blue box, is a node that says, "Four-Part strategy to achieve this goal". 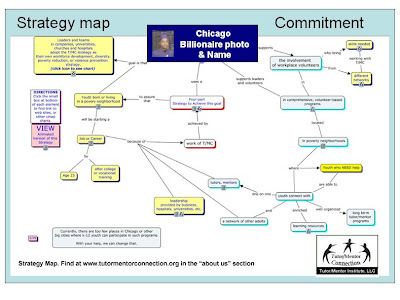 If you open the "four part strategy" link you'll see the concept map I'm showing below. 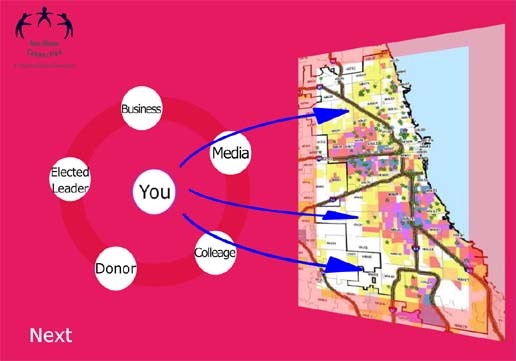 By making the commitment (to goals of strategy map) you're making a commitment to help build the information library, which includes GIS map directories showing location of existing youth tutor, mentor and learning programs in Chicago, or other cities. That's all part of step 1. Then you're also committing to "act like Dan" and help increase the number of people who read our blogs and look at the information in the library (step 2); and to helping form groups in colleges, churches, businesses, etc. that help people understand and apply the ideas and information in the library (step 3). 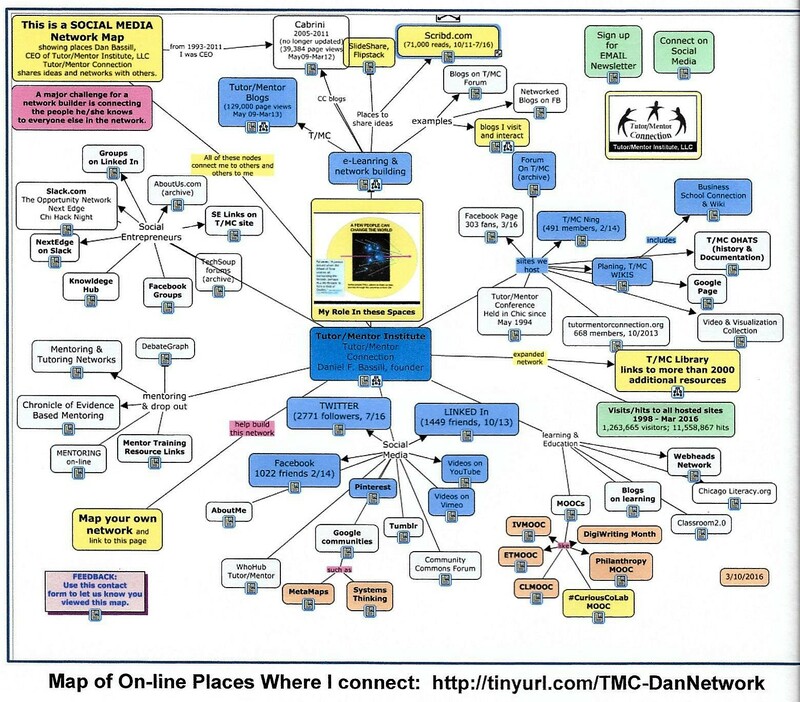 When I say "act like Dan" look at this concept map to see all the places I share information regularly. Imagine how many more people would see this information if 100 people were posting and tweeting and speaking at events and meetings every day. Finally (step 4), you're using your own visibility and communications tools on a daily basis to draw more people directly to youth and family serving organizations that information (step 1) shows are needed in every high poverty neighborhood of the world (also in step 1). It's step 4 where I feel I differ from most others. I want to draw volunteers and donors directly to individual programs, with their web sites serving as their grant proposals and donation requests. Here are a few articles to read about this goal. If you are willing to make this commitment, demonstrate it by your actions, which include (a) putting the strategy map on your web site; and (b) using your blog, web site, Tweets, etc. 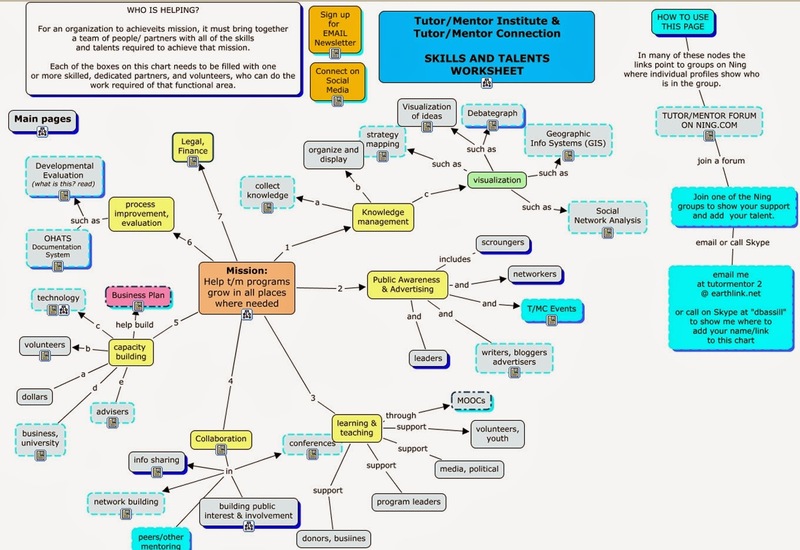 to explain in your own words what the Tutor/Mentor Connection is and what it's trying to do, and to draw people to the Tutor/Mentor library and blogs and web site. See how interns did this between 2005 and 2015. At the left is a concept map that shows the range of talent that I hope some day is making this commitment. I'd like to be able to put links in each node to point to people who are doing the two steps described above. 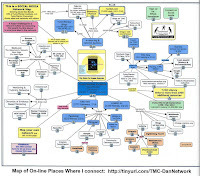 On another concept map I point to blogs and videos where people are already writing about the Tutor/Mentor Connection and Tutor/Mentor Institute, LLC. If you're doing this, send me a link to your story and I'll add you. Out of this network of leaders I need to find a small group who will provide future leadership for Tutor/Mentor Connection as a 501-c-3 non profit, and Tutor/Mentor Institute, LLC as a social enterprise. I have not figured out how to do this, so finding someone who can bring together a team for this purpose is really important. How do T/MC and T/MI differ, other than tax status? Take a look at this concept map. You don't really need to dig any deeper to look at the strategy map and decide if that's your commitment too, or to look at the 4-part strategy and decide if you can help with one, or all four, steps. You don't need any type of permission or formal alignment with me to do either. However, if you want to dig a lot deeper, visit this wiki and read through it to see what has been done in the past, where help is needed, and ideas for what could be done in the future by a new set of leaders. In the short term, you can also go to this page and make a small (or large) contribution to help me keep doing this work. Grant Competitions. Few Winners. Many Losers.